Book it in! CBAA Conference! 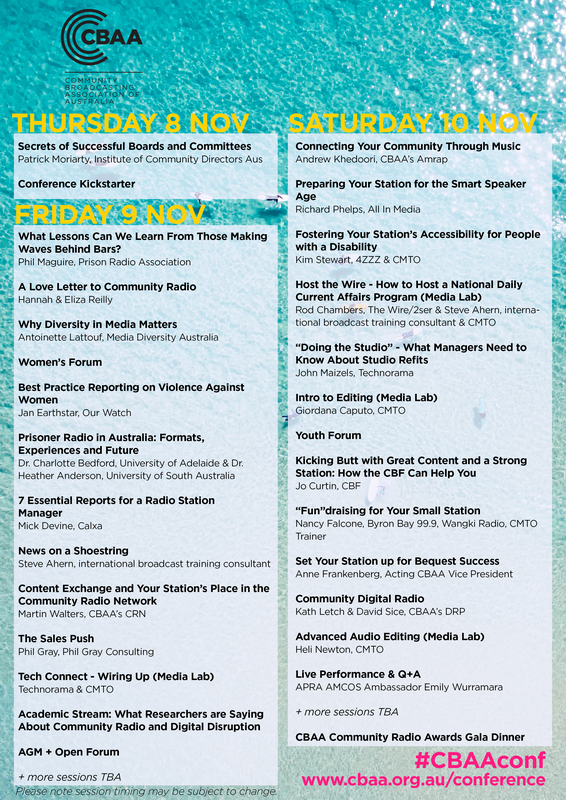 The largest annual community radio gathering - a chance to network, be inspired and develop your knowledge and skills. Phil Maguire from the UK’s Prison Radio Association and APRA AMCOS ambassador Emily Wurramara have been announced, and we're excited to add FBi Radio alumni Hannah and Eliza Reilly from ABC’s Growing Up Gracefully to the bill - and more! Offering an action-packed 2-day program, the CBAA Conference features sessions on everything from community engagement, field recording, and succession planning to culture-building and inclusion. It's your chance to get the latest on what's happening in the sector, network with broadcasters from all over Australia and learn from sector leaders, experts and your peers. Support Australian business that supports your organisation, plan your next technical upgrade with Broadcast Components. Jump on over the the CBAA website to register for the conference.